The beach in Tel Aviv is the definition of casual luxury. Casual because, well, no once cares what anyone wears (not that that stopped me from g.o.i.n.g t.h.e.r.e!). Luxury because, well, you can order just about anything you could ever imagine straight to the comfort of your beach chair. It was a cultural day exploring Tel Aviv, Israel on this day. We started in the Old City of Jaffa, walking through the quiet and ancient residential streets. So much history and culture as we watched families enjoy their Saturday morning Shabbat, catching a glimpse of a family here and there on a balcony, or walking by in an alleyway. 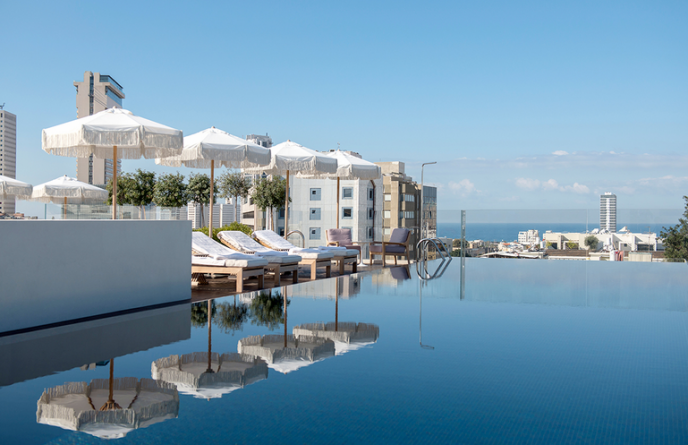 Oh, and then we went to the cosmopolitan Norman Hotel, Tel Aviv's swankiest new 5- star boutique hotel known for rooftop drinks and people watching. I felt like home with my glass of rosé and effortless mini dress! We met up with an old friend from Hong Kong and enjoyed our Saturday afternoon overlooking the city. Now that's the way to tour a city. A little bit of this, a little bit of that. All in perfect situational dressing, of course! Photographs taken in Tel Aviv, Israel. Ok, maybe wearing denim cut-offs and a pseudo crop top wasn't the best idea for a day adventure around Jerusalem... but it also wasn't the worst! And I couldn't be happier that I did it...again! It was even better than the first time. When we traveled back down the mountain at around 8am, we stopped along the road to take these photographs. The desert is so vast in Israel, and it's easy to find yourself looking around to find nothing but sand. I'll never forget this day-- a favorite travel moment of my life. It's hard to decipher what's cooler-- this boss camel or my boss pants. I bought these pants inside the walls of Old City Jerusalem from a Bedouin craftsman. If only you could see how low the drop crotch is on these pretty's-- they drop to my ankles! I. Kid. You. Not. And you know me and a drop crotch. Never met one I didn't like. This camel ride was equal parts regal and ridiculous. The truth is, we were driving up the side of the road leaving our hike up Masada and our dip in the Dead Sea, when we stumbled upon this furry gal hanging at a gas station. I paid her owner $5 for a ride around the gas station, and we shot all of our photos facing the mountain to hide the...gas pumps... that were actually in the background. Isn't it crazy how deceiving photos can be? Back to the wild pants... since these are one of a kind, I searched the internet for pants that had the most similar vibe. Shop my selects below-- promise you'll love them as much as I do! It's rare to find a city in your travels that truly feels like home. This was the case when I stepped my little colorful toes into Tel Aviv, Israel for a long weekend in late June. Dressed in what could only be categorized as casual cool, I walked the city, from shopping on Shenkin Street to people-watching along the long stretch of Herbert Samuel, one of the coolest oceanfront roads stacked with beach cafes with menu offerings for all of your senses: Mediterranean salads, hookahs, local draft beers, board games, and beach games... on repeat! If you aren't roaming the more religious streets of Israel like Old City Jaffa, Old City Jerusalem, and other conservative sectors, then light, airy clothing like this chic romper is a must! But, for touring those parts of town, I recommend long pants and shoulders covered to avoid offending the locals!